Bermuda -Wow, what a stunning place!!! I have just returned from a two week holiday in Bermuda. Bermuda is often mistakenly thought to be in the Caribbean, but it is in the North Atlantic about 600 miles off the coast of North Carolina in the USA. The island is still a British Overseas territory, and the British influence is often visible. Let me say immediately that it is an expensive place to visit, but really worth it. It is an extremely relaxing place with high quality food and accommodation without being corporate or plush. It is a wonderful place for a family holiday. The flight time direct from London Gatwick is 7 hours, and the season is generally held to be May to October, so two half terms and the summer holidays are possible vacation times. It is a small island with only 46 miles of coastline, but what a beautiful coastline. The beaches, which are said to be pink, are long and and often deserted quiet. The pink colour comes from the red coral reefs which surround the island, small fragments of which tinge the sand. Although driving on the left hand side of the road, this is not much help to British tourists, as car hire is not allowed. Travel has to be done by taxi, local buses or local ferries, but this adds to the charm of the island. The roads are like B roads in the U.K., so driving is best left to those who know the area well. The capital is Hamilton, and it is a town with good restaurants and hotels, but is also a port as there is virtually no industry on the island and everything has to be imported. 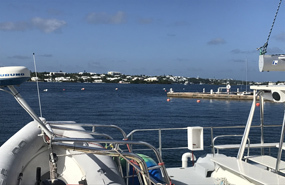 There is no fresh water on Bermuda, so the roof of every building is constructed of limestone and is of a design to collect and filter rainwater which is then stored under the property. Water sports and activities are very popular. The Dockyard area has a super “Swimming with Dolphins ” site. 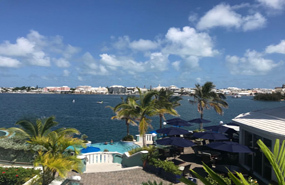 Jet skis, parasailing, boat hire and boat trips are all possible from various parts of the island, and again, the quality of the companies providing these facilities makes it all feel very safe. On the other hand our family spent a whole day on a deserted beach in the north is the island in the sea watching and swimming around wild turtles. It was relaxed, beautiful, and magical. 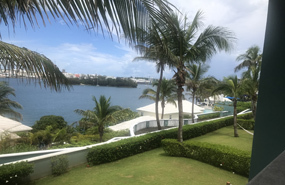 In addition to all of that, Bermuda is a golfers paradise, with at least six world class courses threaded throughout the island, and the views from some spots along the course make it almost worth the walk even for non golfers. This was truly a fantastic holiday on an unbelievably beautiful island, and I recommend it without reserve.